Iridium Communications is working with Amazon Web Services (AWS) to tackle the challenges of using satellite links for the Internet of Things. Low data rate sensors are a suitable candidate for satellite links, especially in rural areas and the 80% of the Earth's surface that doesn't have cellular coverage, but the latency and timing is a major issue. Iridium CloudConnect should be the first satellite cloud-based solution that offers global coverage for Internet of Things (IoT) applications when it launches 2019. Iridium has a constellation of 66 crosslinked satellites and is completing a $3 billion project to replace its entire original satellite constellation with new satellites, known as Iridium NEXT. Seven launches have taken place with launch provider SpaceX, delivering 65 new satellites to Low Earth Orbit (LEO), with the final launch of 10 satellites planned for later in 2018. Upon completion, a total of 75 Iridium NEXT satellites will have been delivered to space, with 66 in the active constellation and nine serving as on-orbit spares. The LEO architecture has much shorter signal transit times than geostationary satellite systems, giving lower latencies. Through CloudConnect, Iridium customers will be able to take advantage of AWS IoT, while existing AWS customers will have a cost-effective way to expand their geographic IoT footprint to anywhere on the globe. According to IHSMarkit the global IoT is expected to continue rapid growth to approximately 75 billion devices by 2025. AWS IoT will create a simplified process for companies to integrate Iridium's satellite reach with AWS, increasing speed to market. Through this arrangement, customers will be able to reduce engineering efforts, lower fixed operating costs, and reduce time to develop new products and services, through the power and capabilities of AWS IoT. The Iridium IoT service has approximately 630,000 active devices as of June 30, 2018, growing at 19 percent a year over the last three years. Each existing Iridium partner will be able to rapidly adopt AWS services though the automated translation of the Iridium network's proprietary protocols and industry standard IoT protocols supported by AWS IoT, to and from the appropriate devices and databases. "Iridium CloudConnect will completely change the speed at which a satellite IoT solution can be deployed and will allow existing AWS customers to keep everything the same on the back end, while opening up the opportunity to quickly expand their coverage," said Matt Desch, CEo of Inridium. "This is a major disruption for satellite IoT. Costs will drop, time to market will speed up, risk will be reduced, and AWS IoT customers that choose Iridium CloudConnect can now enjoy true global connectivity for their solutions." Chinese IoT module maker Quectel Wireless has launched an LTE Category 18 high speed module that offers 1.2Gbps Downlink /150Mbps Uplink peak rates. Based on Qualcomm's Snapdragon X20 chipset and fully compliant with 3GPP R12 specification, the EG18 module supports Carrier Aggregation (CA), 4*4 multiple-input multiple-output (MIMO) technology and 256QAM. The EG18 is part of a series of LTE Advanced modules optimised specially for M2M and IoT applications which support industrial operating temperature range of -40 to 85˚C. It also supports Qualcomm's IZat location technology Gen8C Lite (GPS, GLONASS, BeiDou, Galileo and QZSS) to simplify product design, and provides quicker, more accurate and more dependable positioning capability. The module is aimed at ultra-high-speed Industrial Router, In-Vehicle Video Surveillance System, Cloud based 4K IP-Camera and many more similar applications, which indeed require very high throughput and preferably low latency. Arm is launching the industry's first open-source, fully qualified and product-ready Bluetooth 5 Low Energy (BLE) software stack, giving developers more flexibility in developing new designs for the Internet of Things (IoT) with BLE wireless connectivity. The Mbed Cordio Stack sits alongside a set of Mbed OS connectivity for Thread, Wi-Fi, 6LoWPAN, LoRa and cellular to provide the different options for flexible, secure and connected IoT designs. According to the 2018 Bluetooth Market Update, there will be more than 5 billion Bluetooth device shipments by 2022, with 97% of them containing BLE. Bluetooth Mesh will also drive new market opportunities across building automation, sensor networks, and other IoT solutions. Bluetooth 5 supports 2x the data rate, 4x the range and 8x the broadcast capability compared to the previous version, Bluetooth 4.2. The Cordio BLE stack is integrated with the free, open-source embedded operating system, Mbed OS so that 350,000 Mbed developers can access it and get forthcoming access to Bluetooth Mesh. For silicon partners, the solution gives them access to a full-featured, production-ready Bluetooth 5 stack as part of their Mbed OS offering and the ability to port to additional platforms. Having complete open source access to the stack removes the risk of relying on a stack vendor says Arm, and allows them to meet changing requirements where full source code availability is critical.
. Corephotonics: Triple cameras: are three better than two? Sales of microcontrollers will be driven to a record high by the spread of embedded control in systems, more sensors, and the rush to connect end-use applications to the Internet of Things (IoT), according to a new report by IC Insights. The market for microcontrollers is expected to continue hitting record-high annual revenues through 2022 after worldwide sales dropped 6% in 2016. After reducing inventories in 2016, systems manufacturers stepped up purchases of microcontrollers in 2017 with unit shipments surging 22% and strong growth continuing in 2018. 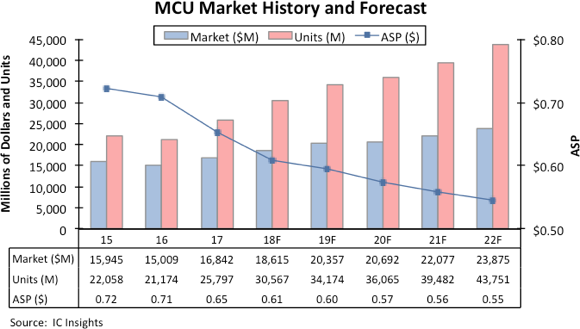 IC insights has raised its projection for MCU shipments to 18% in 2018 with the unit volume reaching nearly 30.6 billion and revenues are forecast to rise 11% in 2018 to an all-time high of $18.6 billion, followed by 9% growth in 2019 to about $20.4 billion (Figure 1). The average selling price (ASP) for microcontrollers fell to the lowest point ever in 2017 and prices are continuing to drop at about the same rate in 2018. However, the annual rate of decline has eased in the last five years compared to earlier this decade. The new forecast for MCU ASP shows the average selling price falling by a CAGR of -3.5% in the 2017-2022 period, much slower than the -5.8% decline seen during the 2012-2017 period and the 20-year CAGR of -6.3% between 1997 and 2017. A key factor in the 2017 recovery of MCU sales from the decline in 2016 was a turnaround in the smartcard microcontroller segment. About 40% of total MCU shipments are currently for smartcard applications, but that is down from about half early in this decade. Excluding smartcard MCUs, sales of “general” microcontrollers for embedded systems, automated control, sensing applications, and IoT-connected things are forecast to grow 11% in 2018 to $16.4 billion after rising 14% in 2017. Shipments of general MCUs are projected to climb 25% in 2018 to 18.9 billion units after rising 21% in 2017. General microcontrollers now represent a little over 60% of MCU unit shipments and are forecast to reach 68% of the total in 2022. Currently, general MCUs generate about 88% of total microcontroller revenues, and they are expected to reach 90% of the entire market value in 2022. Across nearly all MCU applications, strong growth in 32-bit microcontrollers has reshaped the market as suppliers aggressively promote more powerful designs that are cost competitive with 8-bit and 16-bit devices, which have typically been used in consumer products and other high-volume systems. In some cases new 32-bit MCUs are being priced below the cost of 8-bit microcontrollers. On average, 32-bit MCUs were selling for about twice the amount of the ASP for all microcontrollers in 2012 ($1.76 for 32-bit versus $0.88 for total MCUs). In 2018, the ASP for 32-bit MCUs is expected to be just $0.09 higher than the ASP for all MCUs, and by 2022, the difference is forecast to shrink to $0.05 ($0.60 for 32-bit versus an average of $0.55 for total MCUs). MEN Mikro Elektronik has launched a low-power rugged COM Express module that uses the Intel Atom E3900 series of processors. The low power consumption, virtualization support and safe board management controller mean the robust module is aimed at embedded designs in harsh environments and safety-critical applications. The CM50C is an ultra-rugged COM Express Mini module that is compatible with the Type 10 Pin-Out and conforms to the VITA 59 standard which specifies the mechanics to ensure reliable operation in harsh environmental conditions. The E3900 CPU series has a power dissipation envelope of 7 to 16 W with 4 cores and integrated quality graphics as well as Intel VT-x virtualization support. This allows a hypervisor to run multiple applications on a single hardware platform, saving physical hardware and costs. The board management controller provides enhanced reliability, reduced downtime and is certifiable up to SIL 2. A Trusted Platform Module and the secure/ measured booting means fast cryptographic execution is supported and the module supports interfaces such as Digital Display Interfaces, HD Audio, PCI Express and Gigabit Ethernet. 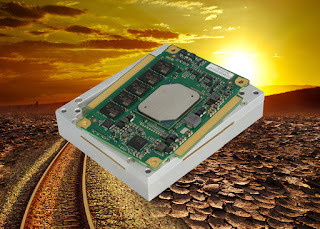 In accordance with the Rugged COM Express standard, the CM50C is embedded in a solid aluminium frame that protects the electronics from environmental influences such as humidity, dust, vibrations or EMC radiation and also enables operation in the extended temperature range from -40 to +85°C via Conduction Cooling. The processor's 15 years long-term availability ensures an extended product life and future-safety for a wide range of applications. For less demanding applications, a standard COM Express variant without frame is also available. u‑blox has launched a rapid-prototyping platform that lets product designers test and optimise the position accuracy and power consumption of wireless location tracking applications that use LTE-M and NB‑IoT cellular networks, as well as Global Navigation Satellite System (GNSS) technology. The toolset combines the u-track software and the C030-R410M application board for product engineers working on battery powered applications such as sport, people and asset trackers. “The toolset offers access to the very latest technologies, from LTE-M and NB-IoT cellular communication to our proprietary Super-E ( https://www.u-blox.com/en/super-e-technology) mode that delivers the best balance between power consumption and GNSS positioning performance,” he adds. The u‑track software runs from embedded firmware on the new u‑blox C030-R410M application board. The board, specifically designed to rapidly prototype applications for the Internet of Things (IoT), includes an ultra-small, low power u‑blox ZOE-M8B ( https://www.u-blox.com/en/product/zoe-m8b-module ) GNSS receiver and a size-optimized SARA-R410M ( https://www.u-blox.com/en/product/sara-r4n4-series ) LTE-M/NB-IoT cellular communication module. u-track also includes a PC software application. Its user-friendly dashboard lets users log, retrieve, and visualize power consumption, accuracy, and other important values, such as the time it takes the GNSS receiver to calculate a position (Time-To-First-Fix, TTFF). Japanese chip giant Renesas Electronics is to buy IDT of the US for $6.7bn, boosting its position in embedded, networking and telecoms markets. The deal follows the acquisition of Intersil in February 2017, and Renesas is aiming at the automotive segment, which is expected to see tremendous growth with autonomous driving and EV/HEV; industrial and infrastructure segments, which are expected to advance with Industry 4.0 and 5G (fifth-generation) wireless communications, as well as the fast-growing IoT segment. Since 2016, Renesas has been executing its growth strategy to thrive in the global marketplace and become a global leading embedded solution provider, says the company. As part of this initiative, Renesas is working to expand its analogue capabilities and strengthen its kit solution offerings that combine its microcontrollers (MCUs), system-on-chips (SoCs) and analogue products. The acquisition will provide Renesas with access to a vast array of robust analogue mixed-signal capabilities in embedded systems, including RF, advanced timing, memory interface & power management, optical interconnect, wireless power, and smart sensors. The combination of these product lines with Renesas MCUs and SoCs and power management ICs enables Renesas to offer comprehensive solutions that support the increasing demand of high data processing performance. IDT’s analogue mixed-signal products for data sensing, storage and interconnect are key devices that support the growth of data economy. Acquisition of these products enables Renesas to extend its reach to fast-growing data economy-related applications including data centre and communication infrastructure, and to strengthen its presence in the industrial and automotive segments. Researchers from Waseda University in Japan and the Japan Science and Technology Agency developed a new bioadhesive, wirelessly-powered light-emitting device which could better treat cancers in delicate organs. "To address this issue, we have developed a wirelessly-powered optoelectronic device that stably fixes itself onto the inner surface of an animal tissue like a sticker with bioadhesive and elastic nanosheets, enabling a continuous, local light delivery to the tumor," says Toshinori Fujie, associate professor of biomedical engineering at Waseda University. The nanosheets are modified with a protein-inspired adhesive polymer called polydopamine, which can stabilise the device for more than 2 weeks without surgical suturing or medical glue. The light-emitting diode chips in the device are wirelessly powered by near-field-communication technology. Engineering firm Occam Technology Group has joined Syniverse’s recently launched Innovation Lab, which provides companies with a secure environment to test new technologies and business models for the internet of things (IoT), 5G, blockchain and artificial intelligence. As part of this, Occam has created a new smart parking lot at Syniverse’s headquarters in Florida to demonstrate and test secure non-cellular IoT connectivity across a LoRa narrowband network. Sensors in the car park identify empty parking spaces and communicate the status of each space back to the Innovation Lab across a secure connection to the Syniverse Secure Global Access network. Occam designs and develops IoT solutions using multiple communication protocols with special expertise in non-cellular IoT LoRa connectivity for low-power, wide-area networks. The company incorporates radio transceivers into IoT devices and adds its gateway software to connect those devices into Syniverse’s Innovation lab across a secure connection to Syniverse Secure Global Access that mitigates the risks of cyberattacks by operating independently from the public internet. LoRa technology enables wide signal coverage with low power usage that results in sensor batteries that only need to be maintained every five to 10 years, on average. This flexibility is proving increasingly important in scenarios with large volumes of fixed sensors, like monitoring agricultural crop production or for sensors located deep inside a building to monitor electricity or parking usage. In these cases, the sensors are not easily accessible and need to span larger geographic areas, so they must have long battery life with minimal required maintenance. At the same time, they cannot afford to risk exposure to cyberattack.